"After many years of having a DJ at our Awards Gala, it was absolutely refreshing to have your trio provide us with live background music – we received nothing but high praises from our guests! Michelle, your group added such elegance and class to our evening. Thanks so much for creating a revitalized atmosphere at this annual event." "Dear Michelle, I wanted to take this opportunity to thank-you for playing your cello at our reception last night. The guest of honour was especially touched by your music. Being an executive level, corporate crowd, many of our guests have a real appreciation for quality music and a number of them commented to me that you are an exceptional cellist. The selection you played was very appropriate and added a wonderful ambiance to the evening. Your professionalism throughout the booking/contract process and at the event was very much appreciated and made for a smooth evening. I wish you much success with your future events. Thank you." "Michelle's piano/drums duo provided a great background for our corporate reception. The music both complimented and enhanced the ambience of the evening and helped make our gathering a huge success." - Lisa Wells, NameProtect Inc.
"We were hosting a small (~100 people) conference at the University of Waterloo (ASITA 2017) and wanted a live music component for the gala banquet. Michelle was very helpful and professional in helping construct a ‘plan’ to provide exactly what we were looking for. The Michelle Kyle website displays ensemble options, music selections and pricing / time rates which helped with budgeting and scheduling the evening event details. We chose a violin/cello duo, which provided a wonderful atmosphere to the evening, while guests mingled with cocktails and throughout the gala dinner. The musical selection was varied and provided a ‘touch of class’ while maintaining the casual feel we wanted. It was perfect, just what we had envisioned. Thank you Michelle and Adam, for making the banquet a wonderfully enjoyable experience and helping make our conference a success. All the best." "Michelle's beautiful piano and cello music created a wonderful atmosphere at our son's bar mitzvah. She presented a wide range of styles from classical to pop to jazz to show tunes so there was something for all of our guests -- even the teenagers. 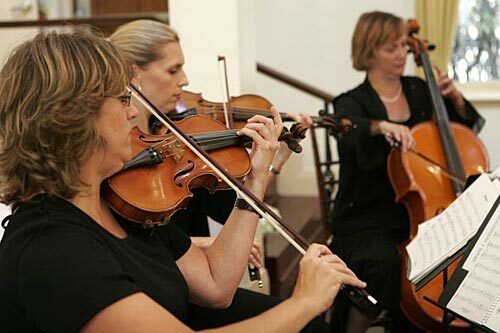 Michelle is a talented musician and a consummate professional, who will enhance any occasion." "Michelle Kyle is someone I went to law school with and we performed together in our school play. Thank goodness she chose to redirect her career. We need more Cello players and fewer lawyers! I appreciated her customization package for her solo Cello performance at my wife's 40th birthday (and so too did my 4 year old son who loves the theme song from Thomas the Tank Engine and Friends). I highly recommend her for any important occasion. She really helped me to make a mark on this occasion. She was also very responsive and helpful to me regarding my needs in making arrangements for an event in Toronto given that I live in New York." "Michelle performed at a cocktail party at our residence for my wife's 50th birthday and she made it absolutely special. Michelle played an amazing range of classical and popular music on both the piano and the cello. Our guests were enchanted by the sound of her music in the house that transformed what would have been a joyful affair to a magical ambiance. Michelle was very professional and we would recommend her to anyone looking for a performer for their special occasion."